Humans possess an incredible ability to identify objects in an image. Image processing algorithms are still far behind this ability. Segmentation is the process of dividing an image into meaningful regions. All pixels belonging to a region should get a unique label in an ideal segmentation. 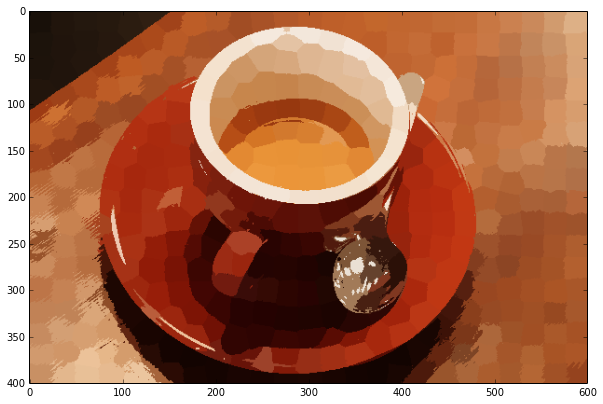 The current segmentation functions in scikit-image are too fine grained and fall closer to superpixel methods, providing a starting point for segmentation. Region Adjacency Graphs (RAGs) are a common data structure for many segmentation algorithms. As part of GSoC this year I am implementing RAGs for scikit-image. The current HEAD of scikit-image’s master branch contains my RAG implementation based on Networkx from my recent Pull Request. In the example below, we will see how Region Adjacency Graphs (RAGs) attempt to solve the segmentation problem.Please note that you need the latest master branch of scikit-image to run the following code. We define the function show_img in preference to the standard call to imshow to set nice default size parameters. 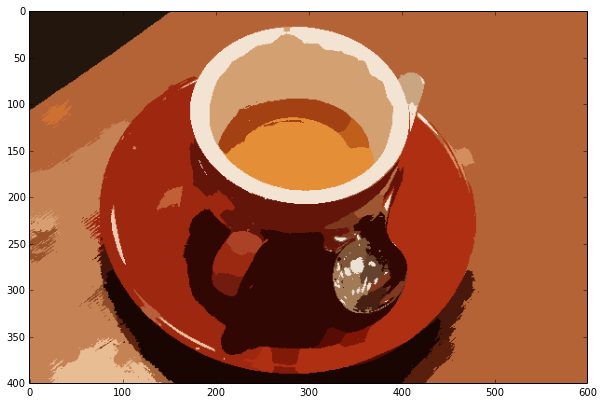 We start with coffee, a nice fresh image of a coffee cup. color. The label of each pixel is stored in the labels array. sing the centroid, purely for visualization. replaces with the average RGB color of its region. Just for clarity, we use mark_boundaries to highlight the region boundaries. the method has been named rag_mean_color. image. It draws edges as green lines and centroids as yellow dots. It also accepts an argument, thresh. We only draw edges with weight below this threshold. and nodes are drawn in yellow. The image to be drawn on. Only edges in `g` below `threshold` are drawn. Image with the edges drawn. myself was surprised with the beauty of the following output. and more sophisticated strategies can improve the initial segmentation. Not perfect, but not that bad I’d say. My next steps will be to implement better algorithms to process the RAG after the initial segmentation.These include the merging predicates mention here and N-cut. How come this image is different from the result in your PR? Can you point out any difference ? 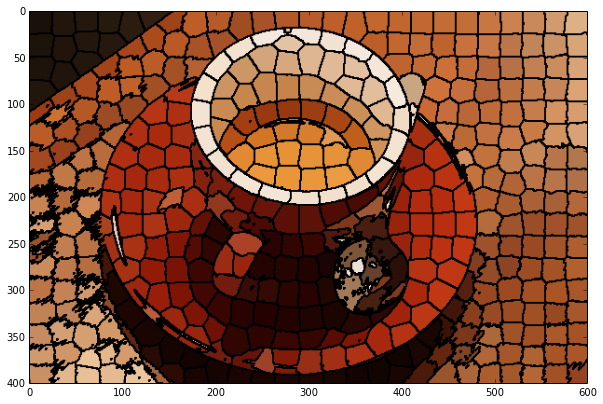 There might be a difference in the scale because these were generated in an IPython notebook. The difference is pretty obvious! For example, in the PR, you can see the shadow of the cup as its own segment. In the blog post, it is merged with the dish. It looks a lot worse actually! I found what was causing the error. I have created a PR here to fix it. Hey Vighnesh, Thanks for the post! Was quite helpful, to know about RAG, when I was looking for a way to connect Superpixels.